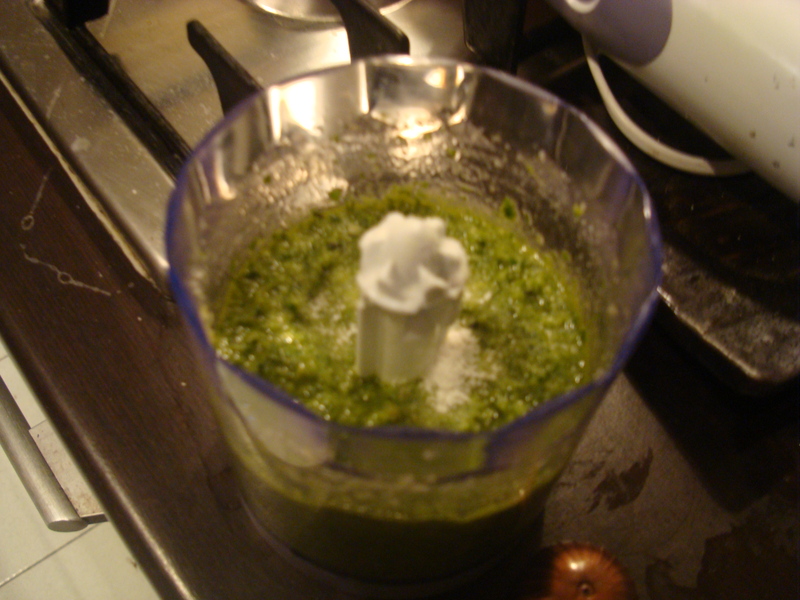 I love pesto but store-bought isn’t as good. It’s so easy to make, by the time you pick out which brand of pesto you want to try, you could have already made this sumptuous sauce. If you make a lot it can be frozen in small portion ready containers to freeze. In Italy I used to just store it in the fridge with a bed of olive oil on top to conserve it, but for some reason, here it’s not keeping as well, so I freeze it. Triple the recipe if you’d like to have several meals. This meal isn’t exactly part of the Dukan diet, but it works for a splurge meal. tons and tons of olive oil. I usually do this in the food processor but if you are feeling particularly Italian, that of an old Sicilian woman, do this with a mortar and pestle, but you’ll need a large one. 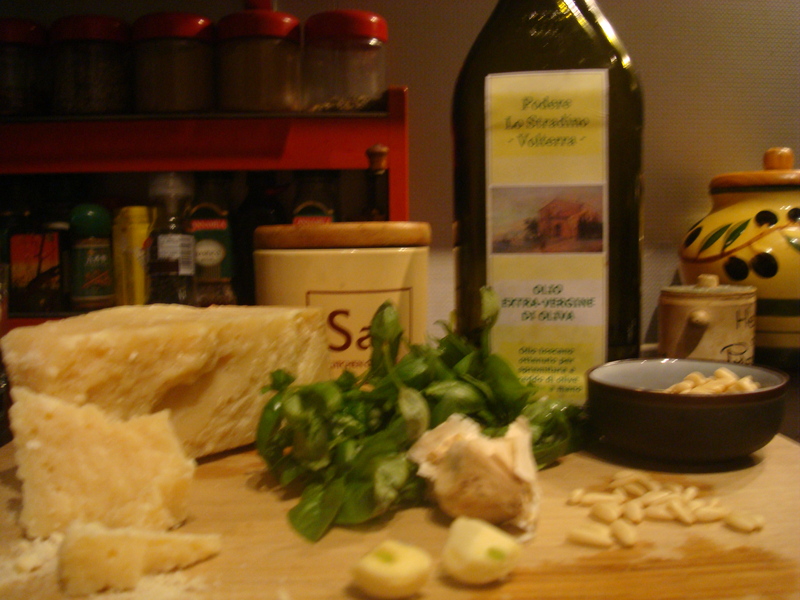 I put the pine nuts in, give it a spin, add chopped garlic, give it a spin, add basil leaves, give it a spin. Then I add the parm cheese… yes, you guessed it give it a spin. Take the small top off while spinning and add a stream of olive oil till it’s the consistency you like. A great way to serve this dish is tossed with cherry tomatoes, some basil leaves and some sort of protein. Grilled chicken, grilled shrimp or seared scallops are excellent with this. Enjoy. It’s a great dish to make for friends. I usually use a fun shaped pasta with this, but also enjoy fettucine. Another great way to use it is as an hors d’ouevre. Just toast some thin slices of french bread, spread some pesto and top it with a thin slice of parm cheese, a piece of basil …. a little half a cherry tomato…. the ideas are endless! Enjoy!